Introducing the five elements of effective reading instruction and providing information on important assessment terms. Learning strategies and activities you can use immediately in the classroom to improve your students’ reading skills. 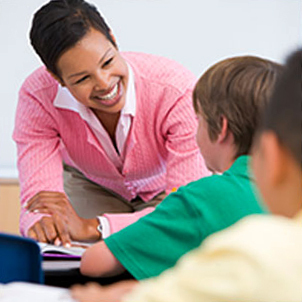 This online certificate, based on the federally-supported Reading First program, is geared toward teachers in pre-K through third grade classrooms as well as reading specialists and those who teach in special classrooms. This first in the three-course series is designed to give background on Reading First as it applies to the No Child Left Behind legislation. In it, you will learn about scientifically based research as it applies to phonetically-based instruction, assessment and evaluation. Explore myths and misconceptions concerning reading instruction and remediation. You will also be provided with an evaluation checklist designed to assess the effectiveness of your current reading program. The goal of this course is to present you with trustworthy evidence and background information to support the need for a reading program that is based on scientific research and proven methods. This course will focus on learning to read, reading to learn and an introduction to reading assessment. Elements of effective reading instruction will be highlighted, including definitions, implications for instruction and future directions. You'll learn the five elements of reading instruction: phonemic awareness, phonics, fluency, vocabulary and text comprehension. Discover comprehensive strategies for reading instruction preparation, including how to integrate computer technology in the classroom. The course will provide important information on terms and definitions and includes 29 specific recommendations for reading assessments. Finally, the course will show you how to conduct pivotal curriculum-based measurement procedures in your classroom.